Posted on 18 May 2014 at 07:53 in Ham Radio. Nathan & I built a slim-jim style antenna tuned for 1090 MHz a few weekends ago for ADS-B reception. What is ADS-B you ask? It’s a signal transmitted by a growing number of airplanes containing a variety of information, including the gps position and altitude. Last weekend, Nathan & I installed the antenna on the roof, and this weekend we got it hooked up and running! For this project, we’re using the slim-jim calculations from this site. We built it out of some 1/8″ brass rod we had left over from the yagi project, enclosed it in some spare PVC pipe, and used a scrap piece of RG-58 that had a PL-259 connector on the end for the balun and the feed line connection. For the actual reception, we’re using an RTL-SDR USB device. You can buy these on eBay for about $10; we like the e4000 variant since it has the widest tuning range. For talking to the SDR and decoding the ADS-B packets, we’re using dump1090. Dump1090 provides SBS-1 formatted output on port 30003, so I wrote a program that will read those in, rate limit flight identification packets to one per minute and location packets to 2 per minute and then record those packets to a database. The RTL-SDR devices are hard to identify when multiple are hooked up to the same computer, so I also wrote a program to identify the device index number by the serial number, which is user-configurable. With those items put together, all that was left was a way to view the data. Dump1090 includes a web-based interactive map, but I wanted more functionality than that, and since I happen to be on the team that develops the open source Lunaserv WMS software, I decided that was the way to go. I installed a local version of Lunaserv with NASA’s Blue Marble basemap, and pointed a couple layers at the new ADS-B database, and what I got was the screenshot shown here. 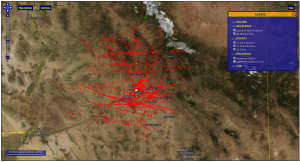 The red dots represent all of the recorded location packets; I included the layer to create a visual representation of the reception range of the antenna and receiver. The green dots are planes that are currently being tracked, and the yellow dot is the location of the antenna. This has been a fun project, and in the future we want to see if we can boost our range a bit. In theory, we should have a signal horizon about about 400km, and we’re not there yet. Although the range we do have is impressive for a scrap piece of brass rod and a $10 receiver!